Femtheogens is a compound word made up of “feminine” and “entheogens.” Entheogens is yet another compound word made up from “entheo” and “genesis” that refers to the mystical and sacred properties of the psychedelic experience. Femtheogens, through its roots in “entheogens,” refers to the feminized sacredness of the experiences such substances can induce. Femtheogens is as much a word, as it is a concept. It refers to the capacity of the entheogenic experience to revive the broken sacred feminine and filter its essence through to us. 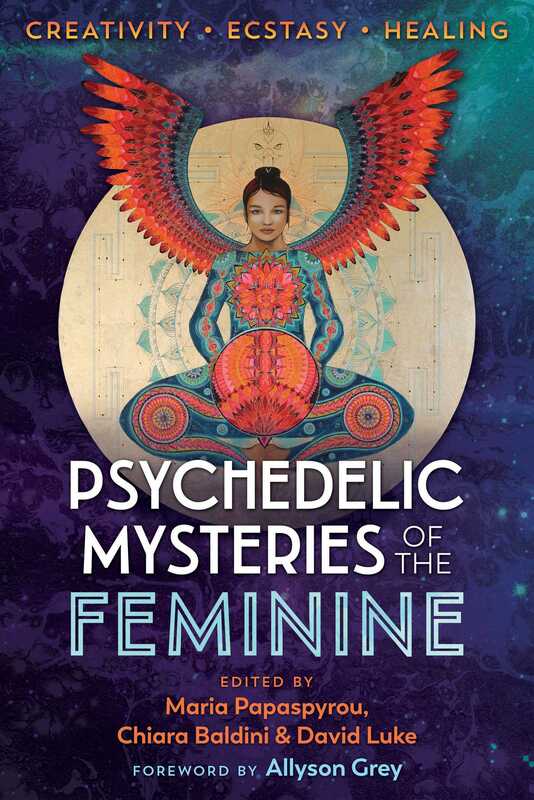 This capacity is enhanced by the strong connections between the archetypal feminine and the entheogenic experience. The two share qualities that can heal, transform, and support the expansion of our consciousness. These qualities are also major points of suppression for both, as they run counter to our western mindset and emergent social paradigms. Femtheogenic consciousness operates in the spheres of oneness. This oneness is a spiritual connection that reveals the reflections we emit to each other. We are all mirrors of our shared humanity, and we all hold each other within ourselves. This oneness is not only a metaphysical idea. It is the oneness that chaos theorists have called the butterfly effect, where a butterfly flaps its wings on one continent and causes a hurricane, weeks later, on another continent. This is the oneness that reveals itself in the intricate dance of cause and effect. It is the oneness of quantum physics and the oneness described by Rupert Sheldrake’s idea of morphic resonance. The feminine consciousness is by nature aware that everything is connected. This is a knowledge the feminine has always carried in her body’s centers of creation, where all life emerges and regenerates from. Similarly, in the infinite realms of entheogenic channels, we can witness the threads of our interconnectedness and interdependence. Here we encounter the pulsating presence of Indra’s net and meet the potential of reawakening our links with each other, nature, the divine, and ultimately ourselves. The invisible space of singularity that femtheogenic consciousness reveals us to contains Eros at its core. To recognize its presence is to awaken to the most powerful force in the universe. The next femtheogenic consciousness link is boundary-dissolving experiences. Our societies are based on divisive boundaries that maintain the illusion of our separateness, and the ultimate and most dreaded boundary to cross is the dissolution of the ego. The ego has been a big part of our evolution, and as a concept in itself it can have many useful functions. What is dysfunctional is our need to hold on to it. The ego needs to undergo many deaths if we are to transform into a more authentic version of ourselves. We need to peel through the layers to reach through to the core of who we really are. The essence of feminine consciousness is based on the elementary feminine experience of boundary dissolution, motherhood, where the ‘Other’ is contained within oneself. That symbiotic bond between mother and offspring is not merely a physical one, as it extends way beyond the physical birthing process. Entheogenic experiences are also, by their very nature, based on the dissolution of boundaries on various levels. In these realms, the divisive lines between us and Other, conscious and unconscious, masculine and feminine, past, present, and future, dissolve, and that is the most threatening aspect of entheogenic consciousness for both individuals and the general status quo. Both the Great Goddess and entheogenic journeys deliver us to a point where in order to evolve, we need to transcend our boundaries, and release ourselves from the ego-driven mirage of our delicate reality. The next femtheogenic consciousness link relates to chaos. We have battled for generations to tame chaos because we have perceived it to be one of our greatest survival threats. It hasn’t always been like that, the early Gnostics and Alchemists recognized chaos as a vital element of the creative process of transformation. Today we relate to chaos as a state of disintegration, rather than a stage of transformation. We have failed to acknowledge the inherent order it contains because its nature is creative rather than linear; it is not to be imposed, it is to emerge. In its field reside the rhythms of matter and the deeper wisdom of the creative process. For our ancestors the Goddess was linked with nature. Nature held the archetypes of the great mother on one end, seeming to give continually in a limitless way, and the devouring mother on the other end, turning ruthless and unreserved. As our early ancestors gradually viewed nature as a chaotic force that needed to be controlled, they reflected that onto the feminine, installing our unconscious collective link between the Feminine and chaos. But the archetypal feminine, in its dynamic aspect, has a creative link with chaos, and that is a link with the transformative and regenerative aspects of chaos. Entheogenic journeys embrace chaos and its transformative potential and teach us it is a valued stage in our unfolding process of individuation. During a deep entheogenic journey we are taken apart and then put back together. Chaos gives birth to a new order that is of greater complexity than before, a step further on our evolutionary journey. A big part of what drove our connection with nature, the Goddess, and entheogens underground is our collective difficulty to be with chaos, and femtheogenic consciousness holds the potential of reviving that relationship in a meaningful way. The next femtheogenic link relates to the vital cycles of life, death, and rebirth. The most potent entheogenic experiences that people report the greatest and most profound changes from are journeys within a supportive set and setting, unfolding into the ultimate spiritual experience of ego-death. Femtheogenic consciousness allows us to flee our ego, if only for a second, and receive the wisdom that necessitates and even welcomes death.